Anyone who has been following our Twitter (@knowsleyarchive) posts over the past few months may have been bowled over by a sudden surge of cricket related tweets and images popping up on our timeline. As you may have spotted, the reason for them is because, thanks to our Heritage Lottery funding, I have been cataloguing and digitising the wonderful records of the Huyton Cricket and Bowling Club. Despite having always been stumped by cricket and my Dad failing to hand over his love of the game to me, this is a collection that’s really hit me for six (okay, okay, I promise that will be the last cricket pun). Huyton Cricket and Bowling Club was formed at a meeting on 7 May 1860, with their first match taking place just a few weeks later against Bootle Cricket Club and they would go on to become a successful club in the Liverpool and District Cricket Competition (as it would become known). Nicknamed ‘the Villagers’, they were moderately successful at different points in their history, with the early 1920s an especially triumphant period. The club was established as a ‘gentlemen’s’ club and during the majority of its history the membership would have been regarded as of a higher social status than some of the other Huyton cricket clubs, such as the Huyton and Roby Working Men’s Cricket and Bowling Club or Huyton Recs. The records in the collection include committee minutes, some very colourfully decorated scrapbooks (see slideshow below), photographs from across the history of the club, fixture books, and correspondence. The minutes, particularly from the first eighty or so years of the club, are filled with tantalising glimpses of some of the intriguing characters involved in the club, on and off the field. They also offer fascinating insights into how the club reacted to major events, both close to and far away from Huyton, including the First and Second World Wars. 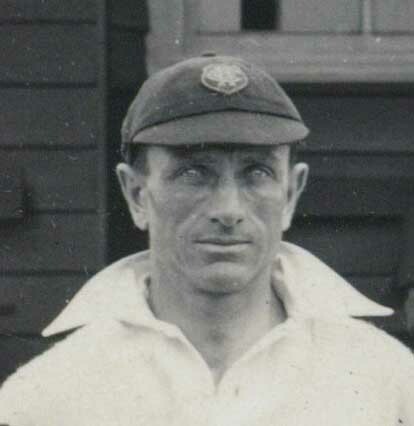 It is during the First World War that we have the first mention of a man who would become a central part of the cricket club’s most successful playing period and remain with the club, in various roles, until his retirement: Ben Barrell. Ben Barrell, and other professionals who were signed up by Huyton, may have had relatively humble beginnings, but most of the amateurs who played for the team (at least during its first 100 years or so) were solidly middle or upper-middle class. 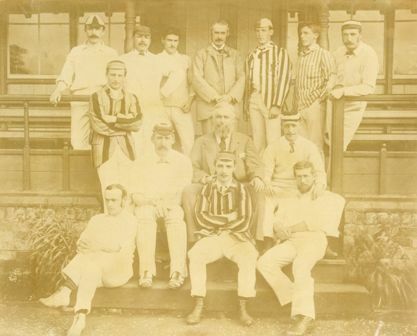 In many of the photographs we have from the club’s early days and most successful periods, players appear relaxed and confident, with an air of leisurely comfort; a cigarette may be hanging casually between the fingers of one or two, or they lounge at the side of a road on the way to a match, a beautiful motor car in the background. A selection of these photographs are in the slideshow below. When trying to get an idea of Huyton Cricket and Bowling Club at different points in its history, the many scrapbooks in this collection are excellent resources. Alongside the match reports, articles, fixture books, and photographs, there are a number of delightful newspaper caricatures of Huyton’s cricket players: a frequent feature of sports columns in local papers at the time. As well as being amusing to look at, they also offer an insight into which of the players were catching the eyes of the local sports reporters and, presumably, the spectators. Some of the cartoons make use of curious illustrations that may be references that would have made more sense to the readers of that period, or could be references to cricketing terminology that goes over my head! The donkey and teddy bear in the Bootle v Huyton cartoon in the slideshow below, for example, could be references to the players’ performances or something else entirely! And what of the white mice in the Wallasey v Huyton cartoon? The Huyton Cricket and Bowling Club collection is a wonderful and evocative set of documents. At some point during the next year or so, one of our Heritage Lottery funded community projects will be focused on Knowsley’s sporting heritage, so I am sure we will be making use of the collection and hopefully giving people the chance to see more of the treasures within it. To not make use of it when such an opportunity presents itself would be…well, it just wouldn’t be cricket, would it? Find Out More About Knowsley’s Incredible History! If you would like an appointment outside of these times, please contact us.